There are 5 Memory Care Facilities in the Reno area, with 3 in Reno and 2 nearby. The average cost of memory care in Reno is $5,472 per month. This is higher than the national median of $4,650. To help you with your search, browse the 24 reviews below for memory care facilities in Reno. On average, consumers rate memory care in Reno 3.1 out of 5 stars. Better rated regions include Sparks with an average rating of 4.4 out of 5 stars. Caring.com has helped thousands of families find high-quality senior care. To speak with one of our Family Advisors about memory care options and costs in Reno, call (855) 863-8283. Known as the Biggest Little City in the World, Reno is the third most populous city in Nevada, where there are over 45,000 citizens living with Alzheimer’s disease. To help city residents affected by dementia, Reno has a number of memory care facilities and a few more in neighboring Sparks. Establishments that can accommodate seniors with dementia and provide memory care services through obtained specialty endorsements include licensed residential facilities for groups and facilities for skilled nursing. They are regulated by the Nevada Division of Public and Behavioral Health, Bureau of Health Care Quality and Compliance. The pleasant overall climate in Reno consists of abundant sunshine, low amount of rainfall and relatively cold winters. It has a Sperling comfort index of 73, which surpasses the national average of 54. This allows seniors to enjoy relaxing outdoors and the view of the city’s surrounding mountain ranges. The Reno-Carson City-Fernley area has poor air quality as ranked by the American Lung Association. Its high rating for ozone and particle pollution may be of important consideration for seniors with respiratory health issues. Seniors in Reno enjoy significant tax savings because the state of Nevada fully exempts personal income, Social Security benefits, retirement account withdrawals and pensions from taxation. This is on top of groceries, prescription drugs and durable medical equipment being exempted from sales tax. Reno is home to world-class medical facilities including those specializing in brain health and dementia care such as Renown Regional Medical Center Institute for Neurosciences, Saint Mary’s Regional Medical Center Neurology and Stroke Care, Geriatric Specialty Care Nevada, Duncan Family Healthcare Mental Health Services and Reno Neurological Associates in the event of medical emergencies or illness. Memory Care costs in Reno start around $5,472 per month on average, while the nationwide average cost of memory care is $4,781 per month. It’s important to note that memory care rates in Reno and the surrounding suburbs can vary widely based on factors such as location, the level of care needed, apartment size and the types of amenities offered at each community. 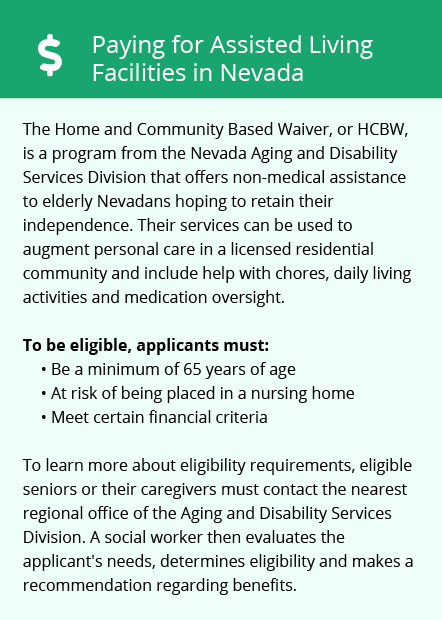 Reno and the surrounding area are home to numerous government agencies and non-profit organizations offering help for seniors searching for or currently residing in an assisted living community. These organizations can also provide assistance in a number of other eldercare services such as geriatric care management, elder law advice, estate planning, finding home care and health and wellness programs. To see a list of free memory care resources in Reno, please visit our Assisted Living in Nevada page. 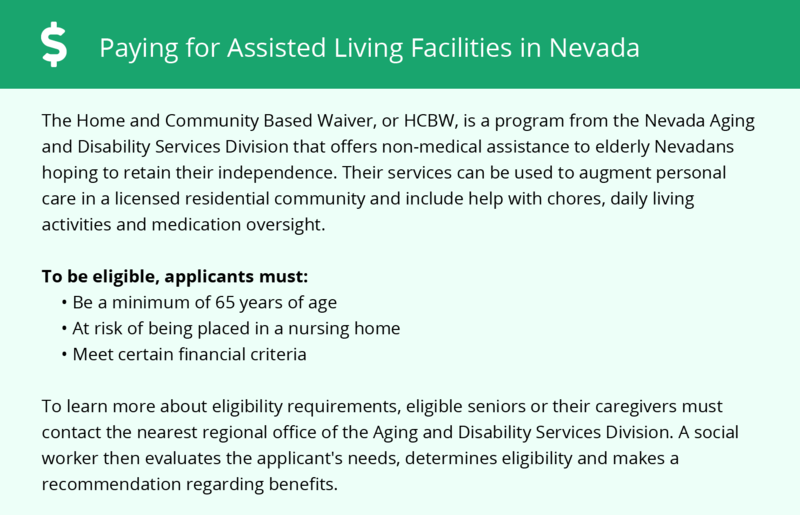 Reno-area assisted living communities must adhere to the comprehensive set of state laws and regulations that all assisted living communities in Nevada are required to follow. Visit our Memory Care in Nevada page for more information about these laws.